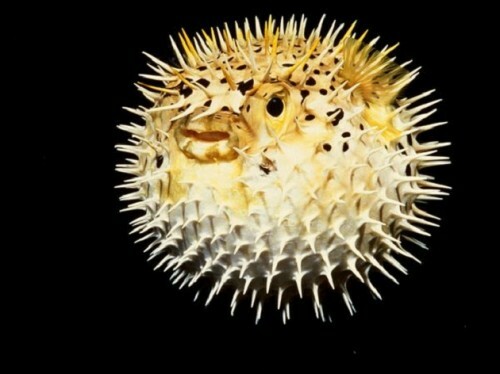 Puffer fish is the second most dangerous animal of all the animals with backbone. Skin and body organs of the puffer fish are very dangerous to human life. Puffer fishes cannot live in the regions of cold water. They live in the warm climate only. There is a strange reason for naming this fish species as puffer fish. If any sea animal is hunting the puffer fish, then it swallows huge amount of water at a stretch. Even if it lies outside the water also, it inhales more air. By doing so, its body becomes bulged and circular just like an air balloon. By seeing the sudden bulging of puffer fish, other animals fear of it. That too after bulging, puffer fish looks dangerous. But some people even eat such a dangerous puffer fish. Japanese and Koreans are fond of eating puffer fish. They wear gloves to their hands and catch the puffer fishes. Then there would be no danger of poison infection from fish by biting the hand. Now these people are evolving puffer fishes without poison.